Due to their durability, reliability, efficiency and availability in standardized sizes and mounting options, stepper motors are widely used in industrial automation, robotics, and new niche consumer products like desktop 3D printers. In this article, we’ll talk about the basics of how these motors work and how to control them. In our recent article on electric motors, we gave a broad overview of the different families of AC and DC motors based on how they convert electrical energy into rotating mechanical movement. Broadly speaking, stepper motors fall into the synchronous category, meaning that the rotor moves in lock step with orientation of the applied magnetic field generated by the stator. This synchronous operation is precisely why steppers are frequently used in applications that require precise motion control. But a feature unique to steppers—a gear like rotor with many magnetic teeth—divides one full rotor rotation into many small angular steps, allowing small, precise amounts of movement. This plus the fact that stepper motors are brushless (and thus have a long lifetime), have made them the motor of choice for industrial automation and robotics. 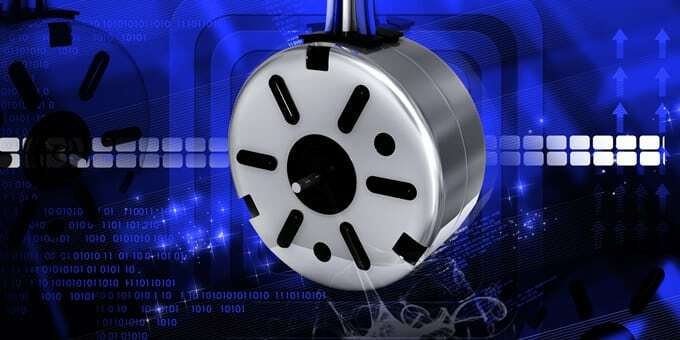 Although all stepper motors share this many-pole rotor, in some steppers each tooth is a pole of a permanent magnet, thus making them permanent magnet synchronous motors. In another type (variable reluctance stepper motors), these teeth are not magnetized but instead made of a magnetically soft material. Although the individual stator coils (phases) in a stepper motor are driven by DC pulses, stepper motors are best classified as AC permanent magnet synchronous motors (PMSMs) since the DC voltage applied to the phases is pulsed at such a high frequency (“chopped”) that the current waveform in the phases more accurately resembles a sine wave (since the current inside an inductor can’t change instantly). This results in the same rotating stator magnetic field found in PMSMs and is especially true when stepper motors are micro stepped. This method of using a high-frequency modulated DC waveform to recreate a smooth AC waveform, is the same one used by audio electronics such as high-efficiency Class D amplifiers and some digital to analog converters (DACs). Although they are great for open loop control, it’s easy to implement a closed-loop control by adding limit switches, Hall effect sensors, and optical sensors. This is a good idea in applications where small cumulative positioning errors are likely (due to backlash, micro stepping, vibration, stalling). The control loop can account for and correct this error. Provide current to the phases. The components that are directly connected to the motor phases (almost always power transistors) must be able to source and sink the required current, quickly switch the phase voltage on and off, and withstand any counter-EMF produced by the stepper’s coils. The power supply that feeds the controller and drive circuitry, must be able to handle the anticipated maximum currents (including stall currents) without sagging and causing a brownout of all attached circuitry. This can wreak havoc in real stepper motor control systems since the same power supply often powers the digital control circuitry as well as the stepper motors themselves. Turn the phases on and off in the right sequence. The sequence in which the individual phases are turned on and off (stepping) determines not only the direction of rotation, but also the torque and the amount of vibration, noise, and mechanical resonances. Keeping the latter to a minimum is crucial to avoiding positioning errors due to step loss, not to mention adverse effects on the rest of the mechanical system. Micro stepping achieves this while at the same time increasing the angular precision of the stepper motor. Generate the right waveform voltage. This includes generating the chopping frequency (often around 30 kHz) and sending it to the power transistors which then modulate the DC current waveform which feeds each of phases. The stepper motor controller modulates the voltage applied to the phases to maintain the current in them, close to a constant value. After all, it’s the current in the coils that determines the strength of the field and thus the torque acting on the rotor. It is commonplace to purchase a single stepper motor control PCBA that includes the drivers, controllers (including chopper) and industrial interface like RS-485, CAN, and even USB. These all-in-one integrated solutions are becoming smaller, cheaper and more powerful, which in turn makes stepper motors even easier to use and integrate into your own designs. With a motor design and assembly group of more than 400 highly skilled personnel, we excel at the design and production of permanent magnet stepper motors, as well as their components, drives and controls. From design to delivery, Providence is ready to take on your next contract manufacturing project. What can we do for you?